PANAMA CITY (CNS) — Panama City has skyscrapers, bumper-to-bumper traffic, and a population of 880,000 within the city limits — more than 1.5 million in the metropolitan area. Yet a group of pilgrims from Indiana found warmth and the diversity of the Catholic Church while attending World Youth Day in the bustling city center. From encountering friendly and welcoming Uber drivers and watching other pilgrims dance to sharing the Catholic faith and spirit, the experience has been a joyful one, said a group from the Diocese of Fort Wayne-South Bend, Indiana. They spoke to Catholic News Service Jan. 23 at the FIAT Festival, an event aimed at U.S. pilgrims. “It’s a unique experience,” said Leo Patino of Warsaw, Indiana, a city of about 14,700. 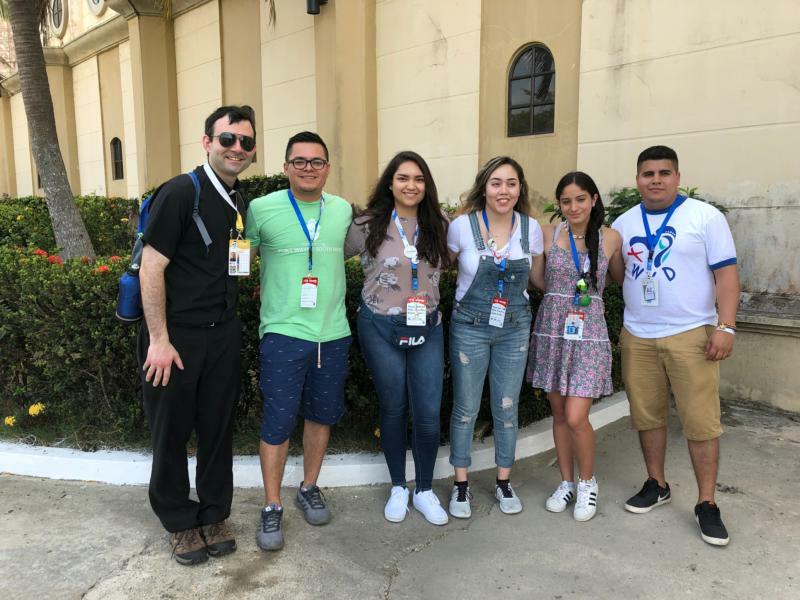 Patino, attending World Youth Day for the first time, said he had found exactly what Archbishop Jose Ulloa Mendieta spoke about at the event’s opening Mass — the warmth of the Panamanian people. “Everyone has been very friendly,” said 17-year-old Sophia Rodriguez of South Bend. Even when the group went looking for hard-to-find Mexican food in Panama City, particularly tortillas, which are not a staple food here, Panamanians told them to call ahead of time and they would do what they could to accommodate them. But one of the biggest benefits has been being able to mix with pilgrims of other countries and also those who express their lives of faith a little differently. Alexandra Castaneda, 17, said the church back home in Ligonier, Indiana, is “more conservative,” so it was beautiful to watch other pilgrims express themselves differently, specifically through dance, and she appreciated the “emotion and energy” she saw in them. It was something that was “different” for her, she said. Rodriguez said it made her realize the variety of styles within the church, but also the different nationalities that make up Catholicism. Patino said being around pilgrims from other countries at World Youth Day has helped him see the church’s richness. The pilgrims said they met people from New Zealand, Colombia and El Salvador and, even though many of them were Latinos like them, they learned new things and appreciated meeting them. “It makes you see the differences” in a good way, said Rodriguez. Eduardo Arroyo, 24, said it was enriching to hear the Uber driver explain about politics and the history of his home country, a place of architectural riches, particularly when it comes to churches. But the biggest gifts of the week came in the discernment process about what this World Youth Day will mean going forward, said Patino. “We’re on fire and we’re ready to put into practice the words of (Archbishop Ulloa) … to confront obstacles and break barriers,” he said.